What can bring the horrors of war more frighteningly to life than tales of orphans victimized by violence? In Iraq, life under the dictatorship of Saddam Hussein has been replaced by a society in chaos, dealing with terrorism from Al-Queda and state sanctioned military interventions established by American troops and now carried out by Iraqis. Add to that the traditional rivalry between Sunnis and Shi’ites and their mutual dislike of the Kurds and you have a recipe for several kinds of civil wars. Atea and Mohamed Al Daradji’s In My Mother’s Arms show the human face of this tragic situation. Husham is a pragmatic idealist, a man who is passionately involved in helping children orphaned by the on-going conflict in Baghdad. A lanky quiet man, he’s moved to speak only when necessary–which is all too often. A Kurdish NGO recruited Husham to work in the orphanage in 2004. When that organization lost its funding in 2007, he took it over and has run it without state approval ever since. Husham has populated the small building he rents with 32-orphaned boys; fed and protected by male volunteers he has recruited. The corrupt practices of the Iraqi state have forced him into a dilemma: he lacks the funds to adequately care for his youngsters but he won’t let them go into a system, which allows for abuse of the children under their care. In My Mother’s Arms follows the events at the orphanage over several months. All the boys are traumatized but two cases stand out. Saif, who has a beautiful singing voice, continually fights with the other boys, who call him “Majuda,” the name of his mother. His protector is Mohamed, a teenager who is a member of the Iraqi Youth Diving Team and a good pianist. When Husham convinces Kadum, a gifted local theatre director to work with the boys to create a play, Saif reluctantly becomes the lead—and does exceedingly well. At the same time as the play becomes a local success, Husham is forced to relocate by his landlord. All the boys are concerned but none more so than Mohamed, who is facing exams in diving and school. His panic over dealing with the potential loss of the orphanage underscores what Husham has done for all of the boys. He’s given them a home, paid for by the local merchants he cajoles, which has saved the young men from a life of homelessness or becoming orphans of a corrupt state. Atea and Mohamed Al Daradji’s film follows Husham as he desperately fights to save the orphanage. The story couldn’t be more compelling—or more Dickensian. 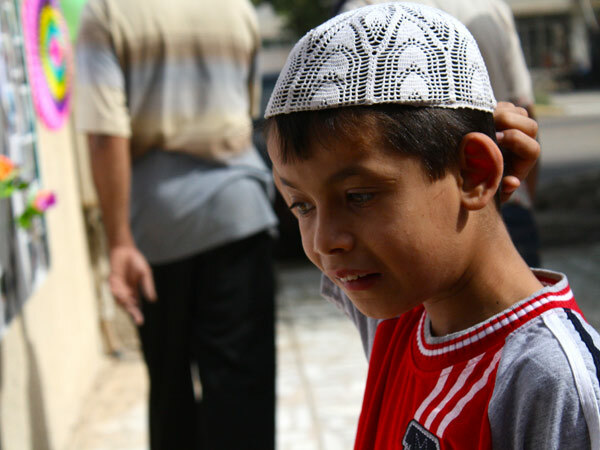 Over 800,000 orphans live in Iraq today and among those who were raised in state institutions, over 33% were abused. In My Mother’s Arms is a moving, socially aware doc that should be seen. On limited resources, the Al Daradji siblings have created a compassionate doc that offers a mirror on a world that the West created, contemporary Iraq.